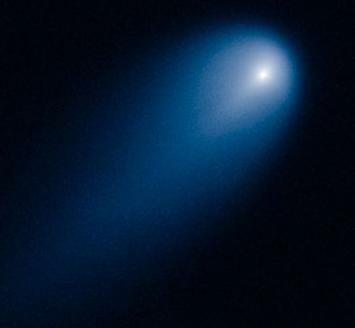 Comet Lemmon (C/2012 F6), which is receding from the sun not far beyond the orbit of Earth, has just experienced a "disconnection event." Disconnection events can be caused by CME impacts. A famous example is that of Comet Encke in 2007. 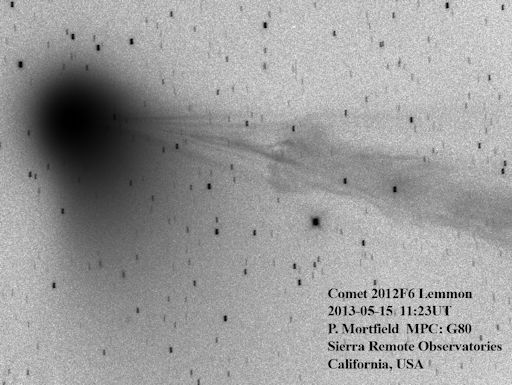 Comet Lemmon, however, is not on the same side of the sun as active sunspot AR1748. It's hard to see how the recent X-flares can be responsible. Nevertheless, solar activity is high and comets are very sensitive to stormy space weather. On April 20, 2007, the comet Encke had just dipped inside the orbit of Mercury, perilously close to the sun, when a solar eruption struck and literally tore the comet's tail off. NASA's STEREO-A probe recorded a fantastic movie of the collision. The eruption that hit Encke was a CME or "coronal mass ejection. CMEs are fast-moving and massive, packing billions of tons of solar gas and magnetism into billowing clouds traveling a million-plus miles per hour. Actually, it is a little surprising that a CME succeeded in ripping off a comet's tail. For all their mass and power, CMEs are spread over a large volume of space. The impact of a CME exerts little more than a few nanoPascals of mechanical pressure. The ripping action must have been something else. "We believe the explanation is 'magnetic reconnection,'" says Vourlidas of the Naval Research Lab in Washington, D.C. Magnetic fields around the comet bumped into oppositely directed magnetic fields in the CME. Suddenly, these fields linked together--they "reconnected"--releasing a burst of energy that tore off the comet's tail. I wonder what would happen if an earth directed CME rips off comet ISON's tail.